First step: Implant surgery. 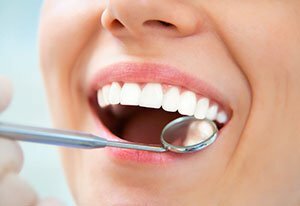 The first step of getting an implant involves the implant placement done by the dentist performing this surgery. The titanium implant screw is carefully placed into the jawbone where once you had a tooth root. After the surgery and during the recovery and healing process it is important to maintain a diet of soft foods and to avoid chewing directly on top of the implant area. Second step: Healing phase. During the healing process, the implant will fuse to the bone surrounding it as it heals in a process called osseointegration. In the majority of the cases, it is best to wait until the implant fully integrates to the bone, which will take a few months, before the implant can receive a crown. In select cases, a crown or a denture may be placed immediately on top of the implants. Third step: Receiving the restoration. When the time comes so the implant can receive a crown, your dentist will custom-make a crown for your implant. The crown needs a post also known as an abutment, to connect it to the implant. The crown will be based on shape, size, shape and will be designed to match your natural teeth. If you are replacing more than one tooth, custom-made bridges or dentures will be made to fit your implants. These custom-made restorations are made by a dental lab and it takes time for them to be fabricated. In some cases, the dentist may design a temporary restoration for your implants in case you need them to function or for esthetic reasons. If you are interested in dental implants, call us to discuss it carefully. At Prestige Oral Surgery, we will prioritize your comfort and care at every step in the process. Ask us if an implant is a good option for you. We will review your medical history and your dental findings to let you know if you are a good candidate for implants. Contact Prestige Oral Surgery at 732-297-7000.